Borås Arena known by fans as the Elfsborg Fortress is a purpose built football ground located in the Borås Municipality in Västra Götaland County. Home to Allsvenskan side IF Elfsborg and lower league team Norrby IF since opening in 2005, the stadium has a capacity ranging from 14,500 – 17,800 depending on usage. 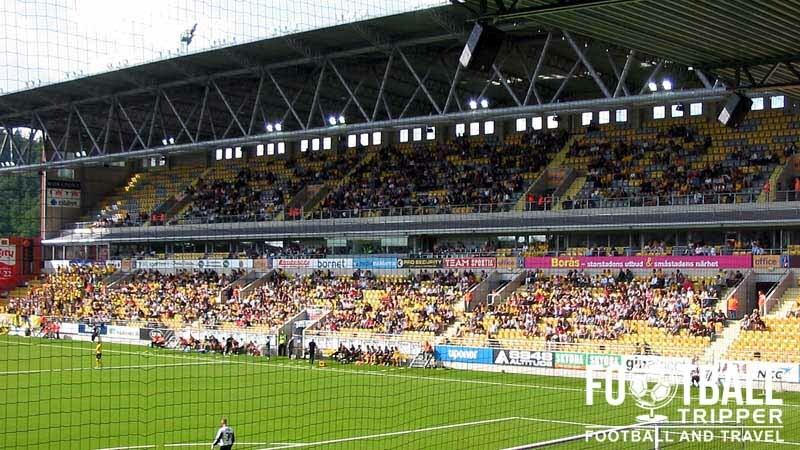 The first competitive fixture at Borås Arena was played on the 17th April 2005 between IF Elfsborg and Örgryte IS, and it saw the home side christen their new stadium with a win. Built over a two year period between 2003 and 2005, both resident clubs previously played their home matches at the outdated Ryavallen which first opened in 1941 and famously hosted matches of the 1958 World Cup. Costing an estimated 112 million kronor and fully owned by IF Elsborg, the creation of Boras Arena inspired a new era of stadium ownership across Sweden, and many other clubs such as Malmo, Djurgårdens and AIK quickly strove to replicate the model. Until 2005, it was normal for Swedish teams to rent their stadiums from the local council, however when this stadium opened other teams quickly realised the economic advantages of owning the football team’s largest asset. 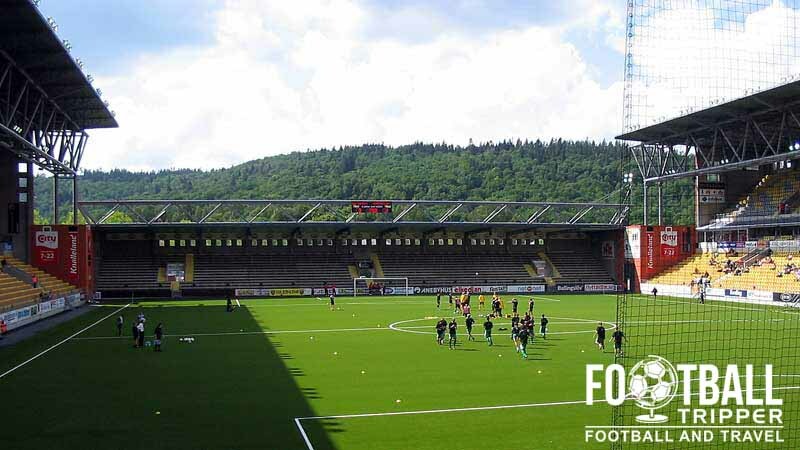 Borås Arena or Elfsborg Fortress as fans commonly like to call it, is capable of accommodating anywhere between 14,800 and 17,800 fans depending which football body is overseeing the match. As standing is outlawed for both UEFA Club competitions and for International matches, the all-seated capacity is normally set at 14,800. This is reflected in the variances between the two attendance records. For domestic matches the attendance record stands at 17,070 which was set during the inaugural season against Kalmar FF, and for a Champions League play-off against Valencia CF, it is only set at 13,148. 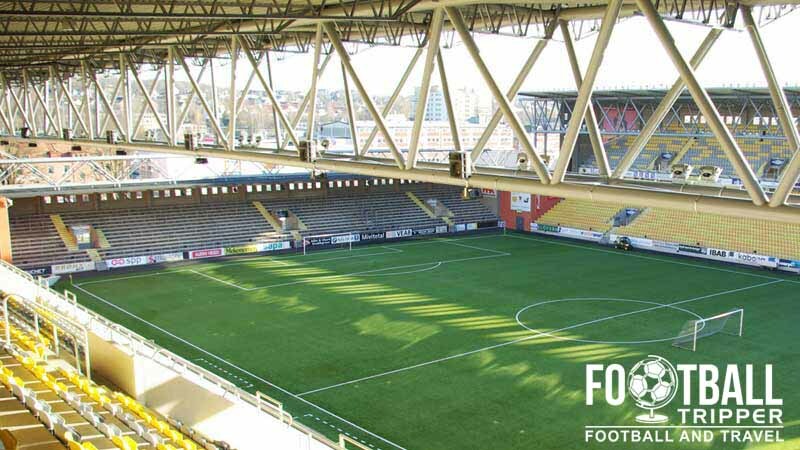 Elfsborg’s ground was initially selected as one of four venues for the 2009 Under 21s Euro tournament, however it was unable to host matches due to sponsorship conflicts. McDonalds requested a monopoly on fast-foods catering within the stadium’s concourse however Swedish Hamburger Chain Max refused to close during the competition which resulted in the impasse. Borås Arena is comprised of four stands: North, East, South and West. Away fans (Bortasupportrar) are housed within the Knalleland Grandstand which in spite of the above seating plan, is actually the easternmost goal-end. Tickets for the Bortaklack section can be purchased with cash before the match starts assuming the game hasn’t sold out. Official merchandise of IF Elfsborg can be purchased online at your convenience by visiting the club’s online store. Unfortunately it doesn’t appear as if IF Elfsborg currently offers guided tours of the facilities at Borås Arena which is certainly a shame. 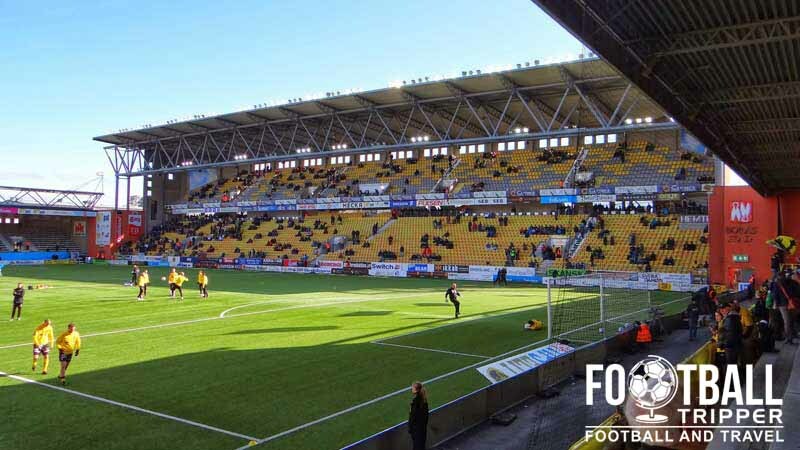 Tickets to see IF Elfsborg play at their fortress can be purchased online from the official website, from the club’s office during the week (Monday to Friday 8.00 am – 6.00 pm), and from the ticket booths around the ground on matchdays. 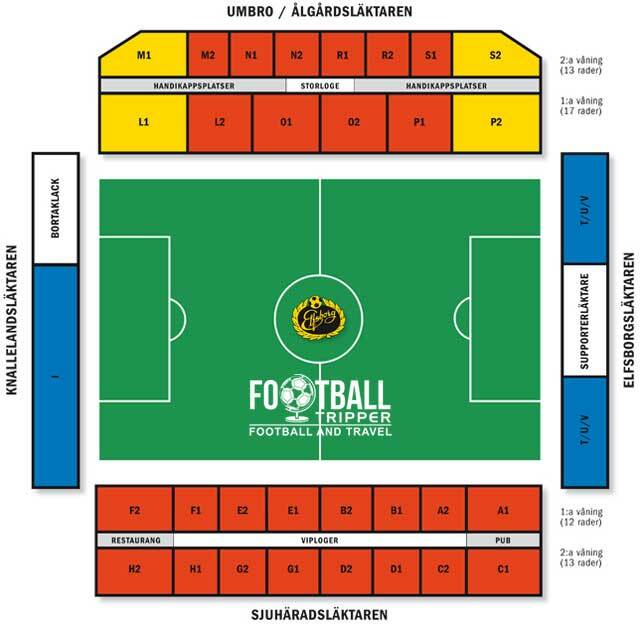 Please note that prices within the main stands can increase for the higher profile matches such as the fixtures against rivals IFK Goteborg. Borås Arena is situated approximately 1.8 km out of town, just beyond the Viskan River and adjacent to the busy Skaraborgsvägen 42 dual carriageway. The walk to to Elfsborg Fortress from the city centre will take most Football Trippers between 20 and 25 minutes. Situated within what is essentially an out of town shopping centre there are several large car parks which you can make use of on matchdays. Just remember to double check any signs to ensure you don’t get ticketed! The closest station to Elfsborg Fortress is Knalleland Station which leaves Football Trippers with a 10 minute walk to the ground. This is one stop away from Borås Centralstation which as the name implies, is located in the heart of the city centre. It has to be said that the back of the Boras Arena looks a bit like a supermarket – at least to me! The dedicated Boras Arena stop a few hundred metres south of the stadium is served by bus number 3 during the week. Along the busier main road the Ryavallen stop can be reached using buses 150, 240 and 582. The two closest major airports can both be found in the city of Gothenburg. The larger one, Göteborg Landvetter Airport, is 55 km to the west, and the smaller one, Gothenburg City Airport, is 82 km away and a favourite of budget airlines such as Ryanair. All of Boras’ accommodation options are to be found back within the city centre. Limited in number, three of the more moderately priced options worth checking out are the Comfort Hotel Jazz, Best Western Hottell, and the Scandic Plaza.